By nature, I am a clean and simple paper crafter, partial to linear designs. As such, I find that I do not use circles as often as I could (or should), particularly large circles or circles that are a design focal point. To remedy that, I set off in search of some sketches to shake things up a bit. I found these two sketches with large focal circles and used a bit from each design to guide my page. The sketch on the left is from an unknown source. It was posted on the Birds of a Feather Kit Co. site. The sketch on the right is from Kelly Purkey. 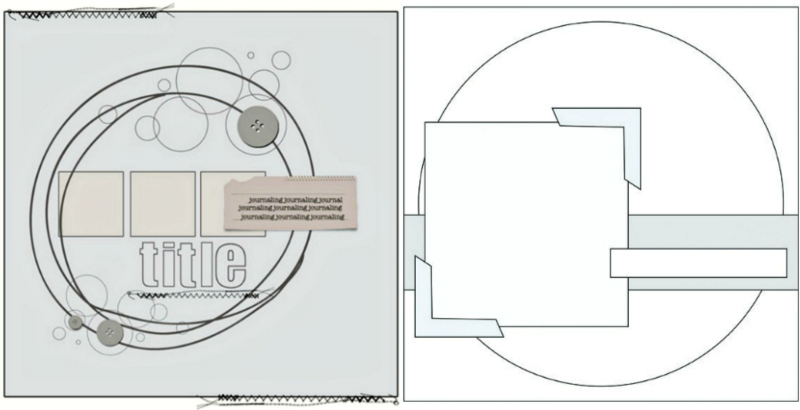 I loved the messy circles from the sketch on the left and I used those as my guiding principle. Then I pulled in the strong horizontal element of Purkey's sketch, but flipped it to make a vertical strip. This photo of my toddler learning to blow bubbles suited the sketches particulary well, I thought, especially the whimsical nature of the left sketch. It was fun to do some messy sewing. At the bottom of the page, I played with a fancier stitch. 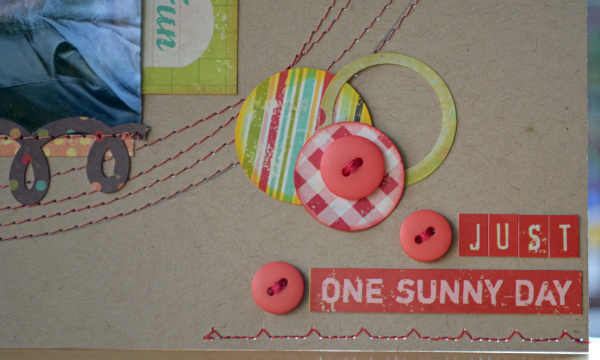 I used collections from Simple Stories for this layout, mostly 100 Days of Summer with a bit of Year.O.Graphy. Giveaway: There's still time to enter the drawing for the brand new Little Yellow Bicycle medley album from the Paradise collection. 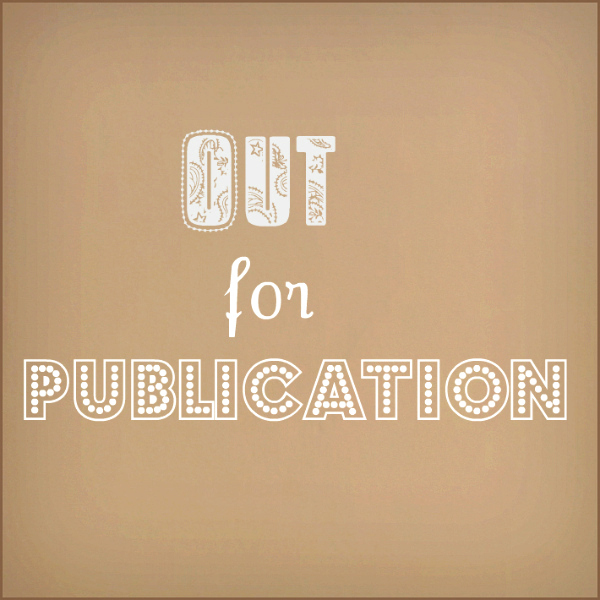 Just leave a comment by midnight EST on Wednesday, Feb. 1 on this blog post. I'll pick a winner by random draw and will post it on my blog on Friday. Thank you for stopping by! 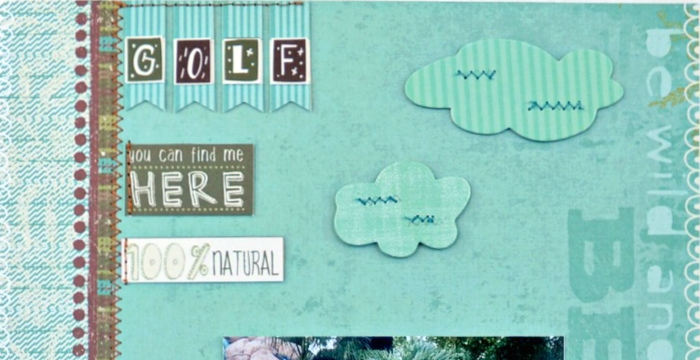 I'm back today with another project as a guest designer for Little Yellow Bicyle's new Paradise line. And, wow, what a fun week I had playing with the Paradise Medley Album. 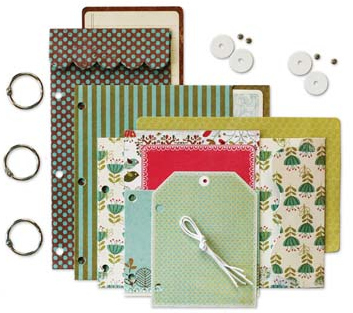 The medley album is an assortment of tags, envelopes and inserts and comes with instructions and color photos to show examples of ways to put the album together. 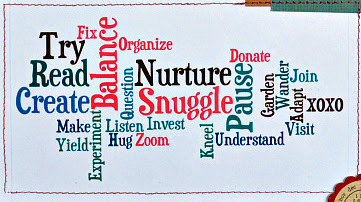 It's easy to follow along with the suggestions or you can do your own thing. 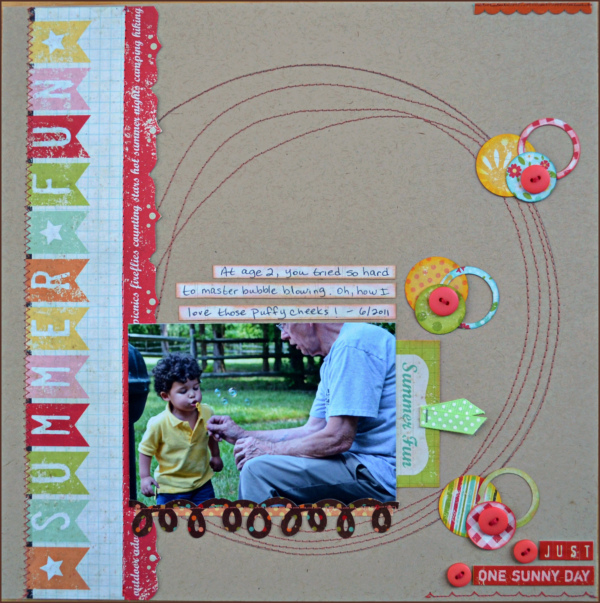 I used the album to document a trip we took to the beach just after my son turned 1 and added several embellishments from the Paradise collection. Before starting the album, I did a little prep work. I added brads and twine closures to the two envelopes and machine stitched a little border around each tag, page and envelop. I used a chipboard title block to make a wee little cover to the album. I covered the back with a little strip of patterned paper, used a cropadile to punch a hole then added the chipboard title to the album. Then I set about embellishing each page. Isn't this a beautiful line? Paradise is one of 6 collections that LYB is showcasing at CHA in the coming week. You can find details about all the new lines on the Little Yellow Bicycle blog. I love seeing all the new collections! Now for the giveaway: Little Yellow Bicyle donated one of these Paradise medley albums for a giveaway on my blog. All you have to do is leave a comment. If you're not a follower of my blog, I'd love to have you join me and I'll be happy to follow you in return. Comments will be open until midnight on Wednesday, Feb. 1 and the winner chosen by random draw. I'll announce the winner here on my blog next Friday, Feb. 3. One year ago today, my sweet little niece was born. How wonderful it was to welcome a new baby into the family. I ran right up to the hospital - with my camera - on the day she was born. There's just nothing sweeter than a newborn baby. And a girl, to boot. I could use pink! 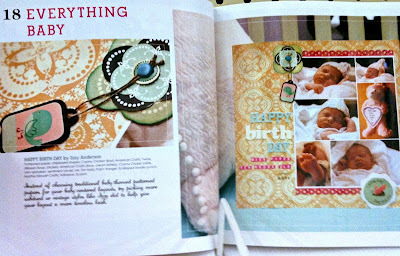 Her mom indulged my picture taking and I made this layout with photos of her just a few hours old. The layout was published in Create Magazine. We were all pretty happy about that. Even my toddler agreed that it was a really good read. Today is such a fun and exciting day for me: I’m kicking off the new year as Little Yellow Bicycle’s first guest designer for 2012. For the next four weeks, I’ll be showing projects with LYB’s new Paradise collection. I don’t know if you’ve seen any peeks of this new CHA collection over on the Little Yellow Bicycle blog, but this is a beautiful new line. Paradise is a wonderful mix of teal, cream, brown and olive with a pop of magenta. 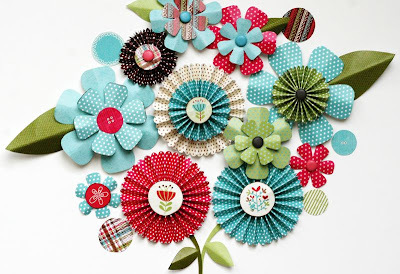 You can see the color mix here in this photo of the collection’s flower kit. Although the collection name recalls a tropical locale, the colors and patterns are versatile enough to work with just about anything. When I got my box of goodies, the first thing that caught my eye was the colorful plaid patterned paper. I’m mad for plaid! 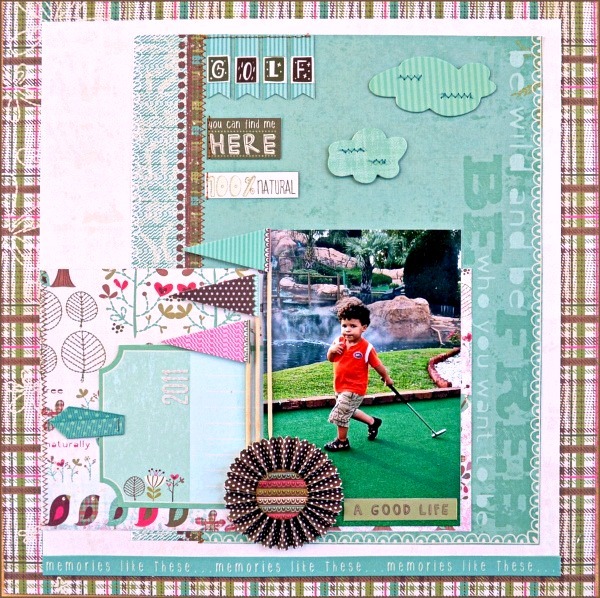 The colors reminded me of madras pants that golfers wear and I knew immediately that I would make a page about my own little golfer. I used the plaid as the base for my page. On top, I used the pretty cream "B" side of one paper and stitched a border strip to the teal paper to make a large block. 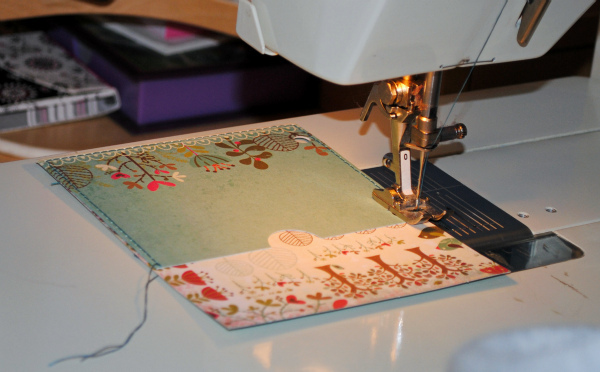 Then I added another patterned paper as my photo mat. 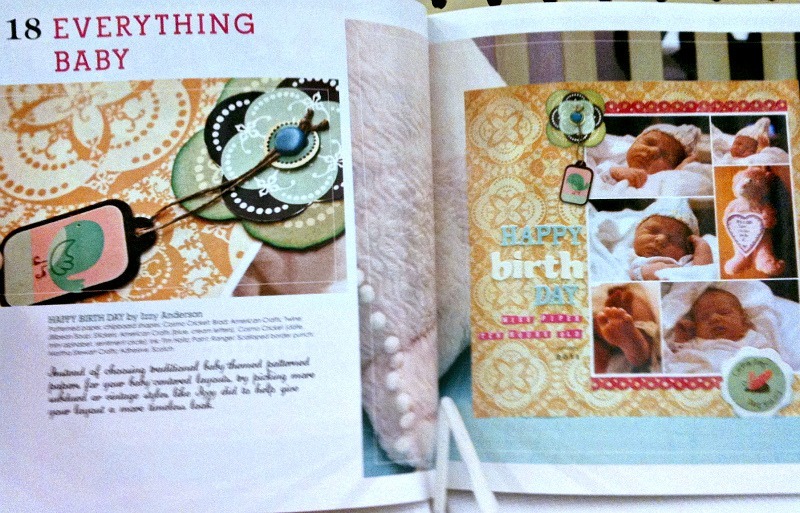 Once I had the patterned paper and photo in place, I began to embellish the page. 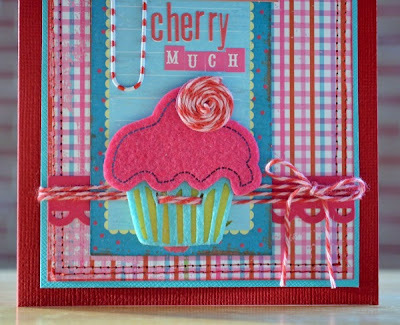 LYB makes it easy because each line has so many terrific embellishments. 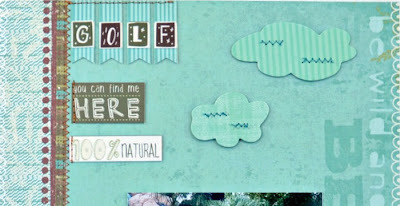 I started above the photo with the golf banner, chipboard clouds and some word stickers. 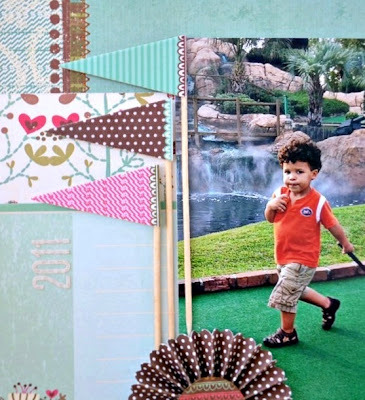 To finish the page, I made a trio of flags to mimic pennants on the putting greens. The flags are from the collection’s Fabric Favorites and were already on pop-dots. I just added decorative toothpicks to make the flagpoles. The accordian flower underneath is from the flower kit at the top of the page. You can find out more about this collection on the LYB blog. 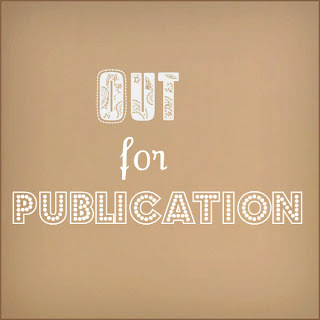 And be sure to stop back by here next Friday for a new project and a Paradise giveaway! I love the trend I've been seeing on cards and layouts lately to sew columns of embellies straight down a project. I thought it would be fun to try this with hearts for a Valentine card. I got out some Echo Park Paper scraps (mostly Victoria Gardens) and a heart punch and made nine hearts. 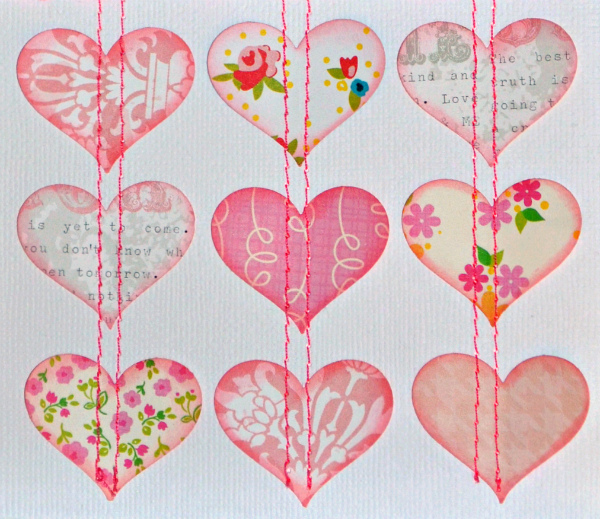 I tacked the hearts lightly in columns on a white cardstock base. I intended to sew a single line down the middle but I got slightly off course on my first row, so I decided to make each row a double. 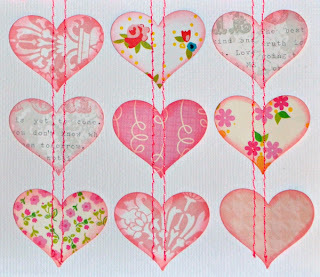 To make the columns of hearts into a card, I followed a layout design for my inspiration. 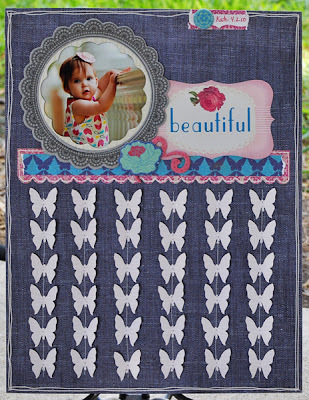 My friend Karen Tarpley made this adorable layout with sewn butterflies. I thought her layout would be easiliy adaptable into a card. 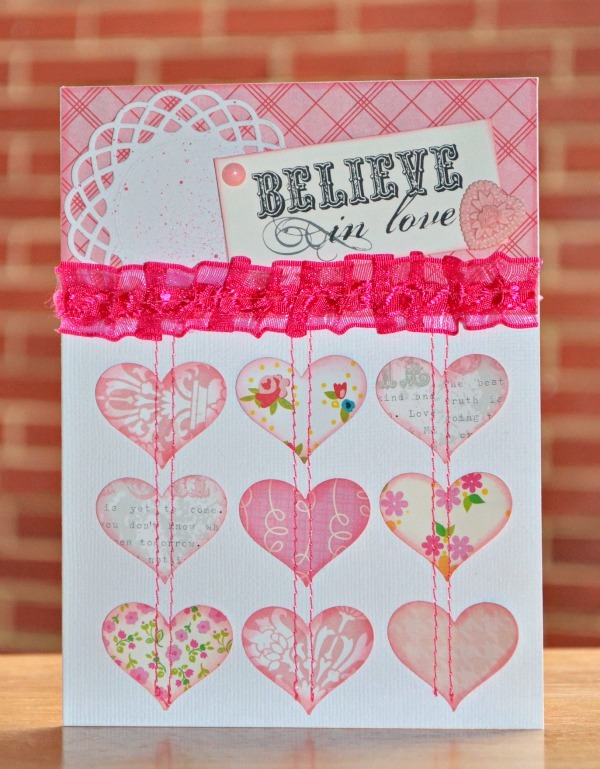 Following her design, I added a bit of patterned paper above the hearts, then added a bit of pink trim, a doily and a journaling card. Thanks for the inspiration, Karen. You can find more of her work on her blog. I'm a firm believer that it's never really too early - or too late - to send a Valentine. I made this card using Little Yellow Bicycle's Cupcake Love and Trendy Twine's new Valentine twine. 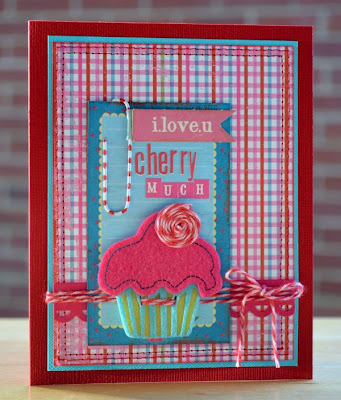 The sentiment says: I love you cherry much. The cherry was super easy to make. 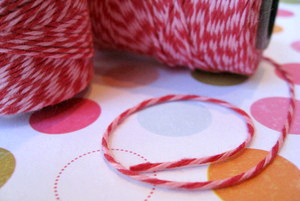 To wind twine into a circle: punch a circle from cardstock and cover with adhesive of choice. Cut about a foot of twine. Tie a knot in one end. Put the knot in the center of the circle and tightly wind the twine around the knot until you reach desired size. Trim any excess cardstock. And here's a closer look at Trendy Twine's new Valentine Twine: It's pink and red swirled together. Love that! You can find our more about Trendy Twine here. This card and other projects using the Valentine twine are featured on the Trendy Twine blog today. Paper Clip: K & Co.